It’s Time for a Rhinoplasty Do-Over! Rhinoplasty, or nose surgery, is among the most requested plastic surgery procedures. Nose surgery continues to maintain its popularity since the nasal structure can affect the entire facial harmony. The nose is the central feature of the face, and it can be distracting when someone’s nose is too big or too small in comparison to their other facial characteristics. Because rhinoplasty is performed on thousands of patients a year, it isn’t surprising that many patients undergo a secondary rhinoplasty. 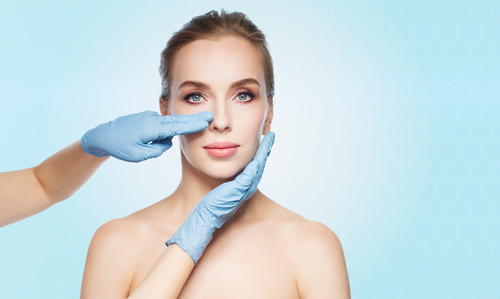 According to the American Society of Plastic Surgeons, the motivation for revision rhinoplasty is similar to that of reconstructive patients. Many revision nose surgery patients have a new or uncorrected deformity. Other patients want to correct botched surgery. Revision rhinoplasty allows them to restore the nasal structure to create overall better facial harmony. Are You Ready for a Rhinoplasty Revision? Do you have any current medical conditions involving the nose? Are you realistic in your expectations? Have you waited at least one year since your first surgery? Dr. Dubrow will evaluate your nasal structure and medical history to help you decide if you are ready for a rhinoplasty revision. Typically, the same incision used for you first surgery will be employed during your secondary procedure. During an open rhinoplasty, an incision is made along the columella (the thin strip of tissue between the nostrils), and the skin is lifted to access and reshape the underlying structures of the nose. Closed rhinoplasty involves hidden incisions made inside the nose through which the nose can be reshaped. Incisions are closed using sutures, and they will fade and become less noticeable over time, if visible at all. A crucial aspect of surgery is deciding on the right plastic surgeon for your procedure. It is important that your doctor is experienced and knowledgeable in rhinoplasty, especially secondary procedures. Dr. Dubrow is a renowned plastic surgeon throughout Southern California and is known for his revision rhinoplasty work. On his show Botched, he has shown his talent and skills as a plastic surgeon. Patients benefit from his personalized approach and his keen eye for aesthetic detail. When choosing Dr. Dubrow for your revision rhinoplasty, you can be sure you are in safe and capable hands. If you are ready for a rhinoplasty do-over, Dr. Dubrow can help! He can evaluate your nasal anatomy and help you decide on the right surgical approach for your unique facial features. Contact us by calling (949) 515-4111 or by filling out our online contact form.